Submitted by EDAS Web Admin on Sat, 15 Feb 2014 - 13:21. Send the completed form to Pathways, Trust Office, 33 Dean Court, Bowmans Close, London, W13 9YU. We currently have 46 people on our waiting list (as of April 2019). I’m often asked “How long will it take to get to the top of the list?” It is difficult to answer because it very much depends upon how many people leave voluntarily and how many are asked to leave each year. At the moment we would estimate there is around a 3-4 year wait. The allotments in Northfield Avenue are not owned by the council but held in trust by Pathways, a registered charity. 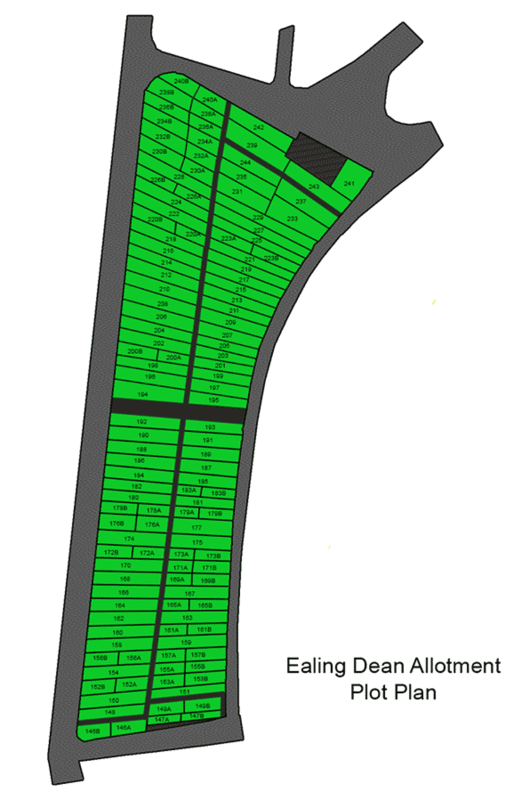 There are over 141 plots on the Allotment (click on the map to see an enlarged view). We currently rent out half plots to maximise the number of plot holders. We work on a strict first come - first served basis. Northfield Allotment is just one of many in the London Borough of Ealing. If you wish to look for a vacancy at other allotment sites then there is a full list of sites, both council and privately owned, on the Ealing Allotment Parternship website (though at the present time, most other sites also have waiting lists). If you are a resident of Northfields then Blondin and Haslemere are the closest alternatives. Several years ago the committee set up a volunteer group consisting of plot holders, those waiting for a plot and local residents. Paths need mowing, hedges need trimming. As well as learning from our experienced growers, It is an opportunity to get some fresh air with people who are passionate about growing. If you have a love of gardening - we hope you will join our volunteer team. We run the volunteer session on the first Saturday of the month - EVERY MONTH - rain or shine. We love this place so we will be there all morning from 10.00 - 13.00. But if you can only spare an hour that's OK too. We will provide the tools and gloves. We'll even sort out some tea and a slice of cake - plus a free BBQ lunch. Yes, we really do have a BBQ in winter (honest) - it is our way of saying "thank you" to our volunteers. You would need to provide a good pair of wellingtons or suitable sturdy gardening shoes. If you'd like to come along please contact us in advance.